The tight-radius Smart Elbow deflection elbow provides a controlled flow, which is especially advantageous when conveying dusty materials such as cement or fly ash. At this concrete production plant, the compact dimensions of the tight-radius Smart Elbow design minimize space requirements compared to long-sweep elbows. The teardrop-shaped vortex chamber designed into the curve of the Smart Elbow creates a deflection zone that minimizes elbow wear and product degradation without compromising material flow. These Smart Elbow deflection elbows reduce aeration of dry cement powder moving through the pneumatic lines, decreasing dust collection demands. The Smart Elbow design features a spherical chamber that protrudes partially beyond the desired 90° or 45° pathway, which causes a ball of material suspended in air to rotate, gently deflecting incoming material around the bend without impacting the elbow wall or generating heat — despite the short-radius design. SAN ANTONIO, TEXAS — Robert Ober & Associates is a specialty design/build firm that serves an international client base for bulk material handling projects that range from $25,000 retrofit contracts to $25 million turnkey plant projects. The company's early focus on pneumatic material handling for concrete plants has grown to include a wide range of material handling, weigh batching, and powder blending systems in mining, grain, fertilizer, food, fly ash, plastics, pharmaceuticals and other industries. About 60% of that focus is on new plant designs and 40% on plant retrofits. The company began specifying Smart Elbow® deflection elbows from HammerTek® Corp. in 2001 to reduce elbow wear and related downtime, but now also relies on them to cut offload times, reduce degradation/dust, improve safety and reduce the space needed for conventional sweep elbow installations. Since initially specifying the Smart Elbow deflection elbow (also called a "vortex chamber elbow" or "non-impact elbow") for wear resistance in concrete plant designs, company founder Bob Ober and his associates have expanded the elbow's use to conveying of materials from fine, soft powders to larger, more abrasive particles such as silica sand in size ranges from 200 mesh (74 µ) to 20 mesh (840 µ). "I do not know of a single vortex-chamber elbow being taken out of service, among all that we have put in service over these past 15 years," Ober says. "They have become an integral part of the fabric of our design any time we are dealing with dilute-phase material transport." In fact, he says his company specifies the elbows as an alternative whenever a client's design calls for long-sweep elbows. The policy evolved after receiving ongoing client complaints about prior uses of long-sweep elbows requiring excessive maintenance downtime for patching or replacing worn-through ells, or clogging of hygroscopic materials. Ober's company has evolved its own installation procedures based on the historic longevity of the deflection elbow's wear resistance in its clients' plant applications. 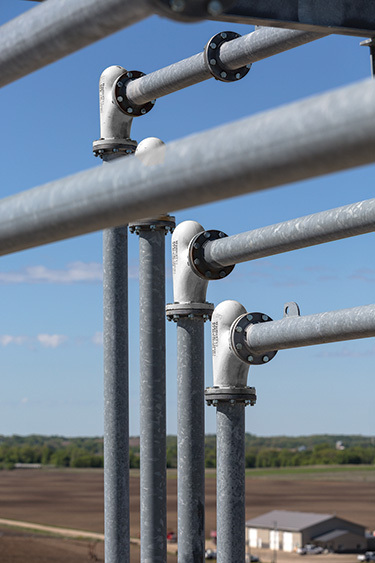 "We will frequently hot-dip the flanged piping and paint the elbows with a zinc-metal cold galvanizing compound, because once they go up they're going to stay there for more than a decade," Ober explains. A unique characteristic of the HammerTek Smart Elbow design is a nearly spherical vortex chamber designed into the curve of the elbow. 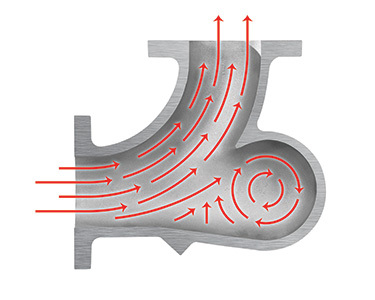 Key parameters allow the chamber to capture a portion of the airflow traveling through the line and cause it to double back into the material stream, creating a deflection zone that minimizes both elbow wear and product degradation. The deflection zone also causes material to exit the elbow more uniformly across the airstream than in conventional sweep elbows in which material skids along the outside radius of the elbow and the downstream conveying line. The airstream sweeps the vortex chamber clean after the material feed is shut off. 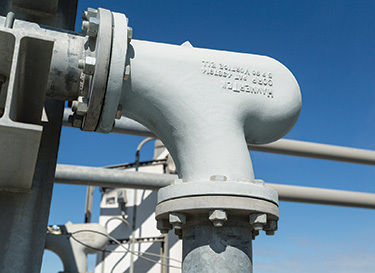 The tight-radius Smart Elbow design requires roughly one-half to one-tenth the space needed to accommodate long-sweep elbows of equivalent diameter. This enables Ober's company to reduce space requirements in new installations and reclaim space in retrofit applications. Although Ober initially specified the deflection elbow to reduce wear and downtime, he has also found it to reduce degradation and dust by preventing material impact. "Based on my years of bulk material handling experience, I also appreciated their ability to improve dust control," he recalls. 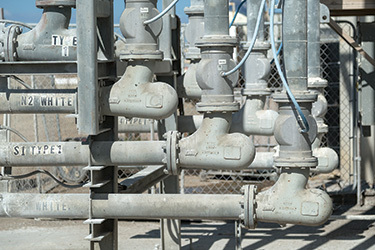 By incorporating the Smart Elbow units into his plant designs, Ober was able to achieve the dust control he wanted while resolving the issues of wear and of bulk materials plugging pipelines. He has found that Smart Elbow installations promote the material flow change from dilute-phase to what he describes as "slugging-phase" flow that deposits materials into storage silos with less aeration and less dust. 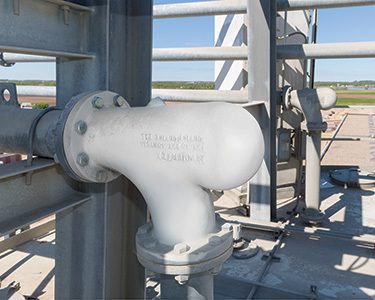 "Using these short-radius vortex chamber elbows provides a more controlled flow," he says, "and for dusty cement and fly ash applications, that's an important consideration." Because about 80% of Robert Ober & Associates' dilute-phase pneumatic transport installations involve offloading of bulk materials from trucks or railcars into storage silos, transfer times are an important measure of design efficiency. The company optimizes the parameters of conveying systems on an individual basis by applying the performance characteristics of the Smart Elbow design to decrease aeration and increase density, thereby reducing the time a transport driver must wait for materials to settle as the silo fills up. Ober notes that some bulk transport drivers were initially reluctant to hook into his plant designs, for fear that the pneumatic transport lines with short-radius elbows would plug up with material. "Some of those drivers were not just skeptical, they downright refused to connect without a call to the dispatcher or to us," he relates. "The first thing we would tell them was to lower the offloading pressure from 12 or 10 psi (.83 or .69 bar) down to 6 psi (.41 bar)," he explains. 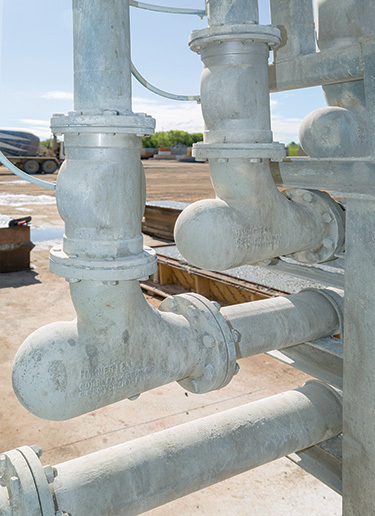 "At that lower pressure, they could get as much product through a 5 in. (127mm) pipeline with a properly specified Smart Elbow system design as they could at 12 psi (.83 bar). They could get it done faster than with a sweep ell, and the product going into the silo was denser, which was a huge consideration." Ober estimates that offload times improve by up to 50% — ranging from 20 to 30 minutes with the deflection elbow design vs. 40 to 60 minutes with long-radius sweep elbows. Long-wear characteristics and less dust being generated within the system also improve environmental and safety performance, according to Ober. "By severely reducing the likelihood of elbow wear-through, we minimize the risk of creating a polluting situation where bulk powder can escape from the system and increase employee exposure," he says. "By generating less dust within the system, the Smart Elbow vortex chamber design also reduces the likelihood of filter media in silo-top dust collectors clogging and causing a safety valve to release material into the atmosphere," he explains. Lower demand on filter media additionally minimizes the risk of a safety valve malfunction that could result in an over-pressurized dust collector being launched from its mounting.